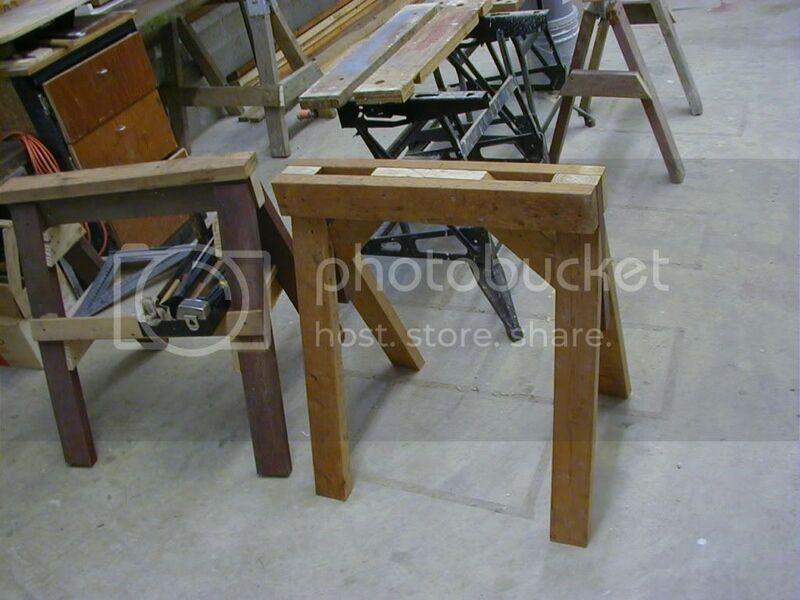 Here is a simple set of instructions for building a set of sawhorses. It is a fairly simple design that most people who have some woodworking experience can build with a fairly basic tools. Its a low cost woodworking project, that will net you a useful tool, and make the projects that come after it just a little bit easier. I am going to try to show a few different ways of cutting the joints with different tools. This instructable is a bit long winded for the more advanced woodworkers out there. But I really wanted to break this down into as many simple steps as I could for the first timers, and show how simple some of basic ideas in woodworking really are. I wanted to show that if you can cut wood, you can build something useful. But before we get into the actual construction, first we should try to tackle the why. There are old timer carpenters who will tell you the story of being asked to build a sawhorse as an interview for the first carpenter job that they got. Today in the days of large box home improvement stores, and injection molded plastic, a set of sawhorses are more likely to be purchased then built. So why build your own? Many simple reasons. 1) You get a design the fits you when you are working with them. Are you very short or Very tall? What are you going to be putting on them? How tall is it? Are you working in a basement with limited height? Do you work more with dimensional lumber or sheet goods? 2) You get a design that fits you when you are not working with them. Can they be designed to store away in a unused corner? Next to the washing machine? Tuck under your workbench? Slide behind the couch? 3) Cost. A solid set of sawhorses that you build yourself can be made from scrap and cost far less then something you buy pre-built. And that savings translates into more freedom to finance the next project. 4) its a good first project. Practice makes perfect. If you have made it this far you are interested in woodworking. Why not crank out a simple project that is low cost, satisfying to build and will help you with every project down the road? 5) Because its your own. Anyone can go buy something, but if you have a quick look around this website you can tell that we all would rather create something. 6) Because you get to build something the way your grandfather(or mother) would have done it. 7) You just find the smell of sawdust appealing. Don't worry, I understand, relax you are among friends. I have spent a while poking around the net, and poking around jobsites, for ideas. There are a few sets of plans out on the internet for sawhorses. And most fall into two distinct catagories. Too Heavy, or Too Complex. I-beams made out of 2x4s, router cut interlocking plywood gussets, expensive hardware, single use designs, ones that only stack one way, exotic materials, bizarre joinery methods, etc. What I wanted was a simple design that can be adapted to whatever materials are available, built by anyone who can cut wood and drive screws. It should be strong, and hard to knock over. You should be able to clamp workpieces to it easily. It needs to stack. It needs to be low cost. It needs a wide enough top that you can just use one if you need to. It should be easy to replicate when you decide you need to build another set, or speaking from experience when it gets left in the driveway, and you back over it. It should be adaptable to different heights. The pictures show what I came up with. I borrowed many ideas for this project from other peoples designs I have seen over the years. Its a simple 2x8" top roughly 2 feet long. with 2 foot legs. The low height is perfect for working on large box 'cabinet' type projects. It works well for ripping down plywood and working with a circular saw. It works in low ceilinged basements. The 15 degree spread of the legs gives a wide stable stance. (If you want to make a taller set I would decrease the angle a bit.) And the lack of bracing allows the legs to flex and sit on uneven concrete floors with out rocking. And allows them to stack even if they all do not get built exactly the same. The tools needed are simple, you need some way to cut wood, some way to drive screws, and a carpenters square, that's it. The first set these that I built was just after we had moved into our house, where the only power tools I had access to were a jigsaw, and a cordless drill. Use what you have, build what you can, and don't be afraid to ask for help from friends with more experience, or access to better tools. Don't be afraid to modify the design as you see fit. This is a choose your own adventure project, and the result should be what you want it to be. The top is a single 2x8" (Dimensional lumber), 2 feet long. For the legs you will need 4 1x6" pieces of lumber 2 feet long. and for the braces you will need some short 2x4" scraps. 26 2.5" or 3" deck screws. That is for one sawhorse, double it for two. These are the materials that I used, you can substitute with what you have, provided its strong enough, and not too heavy. I have made these out of disassembled wooden pallets, scrap plywood. etc. Another tip: Keep your eye out at home improvement centers and lumber yards. Some places have a bin full of short scraps that they will sell you for pennies on the dollar. The Orange Depot calls this 'Cull Lumber' And since all of the pieces we need for this project are 2 feet or less, there is a good chance you can find what you need there. Step 3: The Simple Jig That Will Save You a Lot of Time. The picture below shows the jig that will make this whole project easier. It is a small scrap of 2x4" with one end cut to 15 degrees. We are going to need lay out a 15 degree cut at least 8 times in this project, so rather the measure every single time. It is much faster to cut something at that angle and use it to mark all the other angles we need. Its also makes sure that they are all the same. So if you and up with 14 or 17 degrees instead of 15, it will not matter too much because all the angles will be off by the same amount. Step 4: Laying Out the Cuts for the Top Rail. Now that we have a design and the materials, its time to start laying out the cuts. There are a many different ways of cutting the top, which one you choose is entirely up to you. I will show you three different ways of laying out the cuts and joinery on the top rail. Which you choose is entirely up to you, and which tools you have access to. What we are after is a way to angle the legs so they splay outward and make the sawhorse more stable. So we need to cut an angle off of the sides of the top rail, but only the first 6 inches or so. Now we could cut an angle along the entire edge of the top rail, but it would make clamping things to the edge of the top rail impossible in the future. So for the first two methods we are just going to angle the 6 inches of top rail at each end. Step one measure 6 inches in from the end of the top rail and make a mark all the way across the top rail. Step two take you angled block (jig) and mark the end of the top rail with the 15 degree angle starting from the bottom outside corner of the top rail (viewed from the end) and draw a line from the top of the top rail to the bottom. Step three, connect the line on the end of the top rail to the mark you made in step one. Step four A, if you are going to cut the angles for the legs with a handsaw draw an additional line from the top of the top rail to the bottom at the 6 inch mark. Step four B . If you are using a jig saw or a band saw extend the line that you just drew past the 6 inch mark and curve it out to the edge of the top rail. You can do this either freehand or by tracing something circular. Now repeat this process for the other 3 corners of the top rail. Cutting the top rail is entirely based on which tools you have and want to use, or what you have access to. Most of the info you need is in the tags in the pictures. Step 6: Drilling the Counterbores in the Top Rail. We want to recess the screws that hold the braces below the top rail. Why? Because there are fewer things that can ruin your relaxing day of woodworking then destroying a blade on your saw by hitting a screw with it. So we are going to counterbore the holes for the screws on the top rail. If this sounds complicated, its really not. The first picture shows a cut-away version of the top rail. All we are doing is drilling some holes about halfway through the top rail that are larger then the screw heads, which allows them to sit far below the top, and away from things like saw blades. If it looks a little diffrent then the top rail used in the other pictures, its because I built it out of scraps and all I had was 2x6 instead of 2x8. The legs are much simpler to cut out. In this case we are starting with 4- 24 inch long pieces of 1x6" lumber. One end needs a bevel to be cut on it, to match the 15 degrees like the side cuts on the top rail. You can also bevel the bottom of the leg, but I find it is not necessary. I have access to a compound miter saw that I used to cut the bevel onto the tops of the legs. If you have jigsaw, or a circular saw that can be adjusted to a 15 degree angle you can use that. A little tip for those of you only using a handsaw. Cut the legs about an inch longer then you want them to be. And allow that extra inch to extend past the top of the top rail when you assemble them. Then when you are finished, use the saw to cut the legs flush with the top rail. See? You can build this project with just a handsaw and a drill. Don't think about the tools or skills that you don't have. Think about what you can do with the tools and skills you do have. The taper: Tapering the legs is not absolutely necessary. But it does save some weight and adds a certain look to the project. Cutting the taper is very easy. First measure out the length of the non tapered top section and mark it. Then find the center of the bottom of the leg, and make a mark. Then simply connect the two marks with something that is straight. And cut along the line. You can do this with a circular saw, a band saw, a jigsaw, a handsaw, or if you have access to a shop with table saw and a tapering jig, you can use that. When you go to lay out the tapers on the legs, remember that the top is angled. And if you taper it the wrong way, you will end up with 4 right or left legs, instead of 2 lefts and two rights. If you keep them stacked up in sets you reduce your chances of a problem. Step 8: Cutting the Braces. I recommend cutting each brace to length one at a time, lumber is not always the same from piece to piece. Cut the 15 degree angle on one end. Line it up with the top rail, mark the other end of the brace for length, and mark the angle with your 15 degree jig. Since this is a project is being built with rather loose tolerances, I recommend numbering the braces as you go. Especially if you are building more then one at a time as it will avoid confusion. Step 9: Assemble the Top Rail and Braces. If you do not have workplace to start with where do you start working? Attach the top rail to the braces with 3 screws per brace and the glue of your choosing. I cannot stress enough that the glue is important. Now comes the slightly tricky part. Adding the legs. Holding everything in place while you screw the legs on is a bit of a trick. You can steal a few of the ideas from the pictures. Just make sure that you use 3 screws into the top rail and 2 into each brace(per leg) and don't forget the glue. The glue is where the real strength is. Pre-drilling the holes helps to make the attaching the legs much much easier. I usually put one screw in loosely in the top center of the leg, and then use a square to check that the leg is at a right angle to the top rail, and then add the remaining screws. Another thing that i have noticed, once you build one of these, you can use it at a jig to build the second one. You are done. Well... .. if you want to be. If you built one, I really would recommend having two. And if you check the second picture, you will find out that 2 is never enough, if you get into a serious project. If they are to live outside a coat of paint will make them last longer. I recommend marking them in some way so you know that they are yours. Wait, you built them, you will never forget that they are yours. I just wanted to show you a few ideas of how these can be used. I hope that this instructable has encouraged you to go out an build something. Something simple, something useful, something which at this point is somewhat old fashioned. But that was the point. Build something. The angles all look pretty neat cut, it looks like a good job. I worked in a cabinet makers for a few summers and experienced SawHorse Snobbery! Basically the guys in the next unit, veneer people, made saw horses like this. The old boys in our joinery laughed at them as they were made like yours with screws essentially taking all the weight. Our ones were all mortised and tennoned in such a way that the main strut across the top rested directly on the legs rather than having them screwed in the side. There's no denying, that would be a stronger design and if I were making some I'd make some effort to rebate a cut in the legs so the top strut rested on something solid, but truth is, our one's were thoroughly over engineered and probably took a day to build whereas the screw together design was probably knocked up in an hour or two. I guess its horses for courses, do you need them to last for ever or just until they've gotten a bit knicked and chopped and had a reasonable life anyway. The guys in my joinery probably had a pride issue too. If someone came round looking at fine cabinets and saw falling apart equipment it wouldn't look so good (not that I ever saw the screw together type break in anyway). Just thought I'd put all this in for anyone else considering sawhorses and their longevity. Thanks. I have seen some really beautifully built sawhorses and workbenches over the years. But as far as I am concerned, tools should be designed to be used (and or abused if necessary). I had some real debates about the strength of a design like this, and it seems solid enough. And the other part of the argument is that it only needs to be strong enough to hold something you can lift onto it, which should max out at a few hundred pounds for even the really big burly people out there. I want to bring one of these to work one of these days and see about some static load testing. If I get around to it I will be sure to post the pictures. That is why you make a horse with holes in it. In my opinion, tools can be as nice looking as you want them to be, as long as it doesn't harm their ability to be used. I'm interested in that "Static load testing" you mentioned. But yours toymotorhead, look both strong and multipurposed,I like yours more than most. Back in the days when I built houses full time we carpenters built all variety of horses for different purposes- the trim carpenters usually had the lightest and most portable horses (they were also the oldest guys on-site so we young framers held opinions about that) and the framers were determined to build horses that could not be broken (not possible BTW- there's always something of sufficient mass to crush anything!). The point is- horses are built to meet the need- any design is valid if it does the job. Nice job on these horses and good 'ible! I'm not old enough to have had to build a sawhorse for my first job interview, but my shop teacher had each student build a sawhorse for the schools' industrial arts wing using only hand tools. A completed sawhorse graduated a person to using power tools. Nice instructable, excellent detail pictures, thanks for returning fond memories. this step illustrates your countersink beautifully. Thanks for bothering to chop it up to show us. Somehow, I've always found sawhorses to be the most useful tool I own. We finally had to replace an old pair (roughly 20 years of hard use) after a slip with a saw blade. The new, light plastic replacements are fairly good (we needed hinged horses), but we keep a few old wooden ones as temporary shelves and such (home-built too). It doesn't really matter what project I'm working on - I grab the horses out of the shed first. Not old fashioned by any means. nice and hefty, good job!